AP Teachers Transfers #Schedule, AP Schools #Rationalisation Schedule, Teachers Transfers through Manual Counselling Instructions New Schedule, Online Application; AP State School Education Department has issued the Schedule for Conducting the Teachers Rationalisation and Transfers through Manual in all Districts of State. 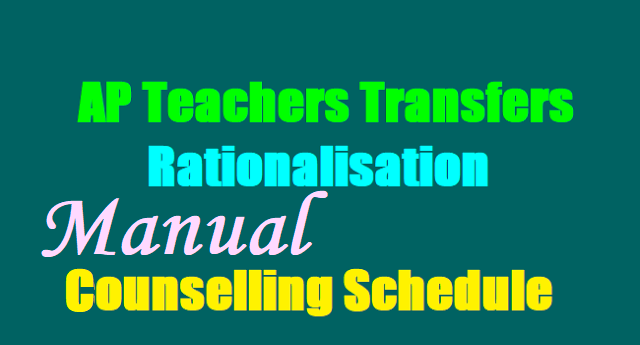 Certain guidelines, instructions and procedures have been prepared and issued on AP Teachers Transfers and Rationalization- Manual counselling.This schedule for Teachers Transfers and Rationalisation and this schedule has got approval by the DSE AP. Sub:- School Education -The Andhra Pradesh Teachers (Regulation of Transfers) Rules - Amendment - Communicated - Further Instructions - Issued - Reg. 9. G.O.Ms.No.38 SE (Ser.II) Dept., Dated:- 21.06.2017. 11. G.O.Ms.No.43 SE (Ser.II) Dept., Dated:- 30.06.2017. A copy of the Government Orders received through reference 11th read above is here with communicated to all the Regional Joint Directors of School Education and District Educational Officers in the State for taking necessary further action as ordered by Government in the matter immediately. Further, all the Regional Joint Directors of School Education and District Educational Officers in the State are informed that due to amending now the Rules 2 (i) (b), 6, 7, 8, 9, 10, 13 (a), 15 (caption), 15(i), 15 (viii) and 17 (ii) of AP. Teachers (Regulation of Transfers) Rules there is no further need for teachers who have already applied for transfers through online to edit the relevant fields in their applications. The system will automatically generate the points as per their eligibility and will upload the modifications against their online application. The revised Time Schedule (Annexure-1) and Step by Step process for Manual counseling (Annexure-11) for completion of Transfers exercise is enclosed herewith. The transfers schedule should be followed scrupulously without any deviation . Further, all the Regional Joint Directors of School Education and District Educational Officers in the State are requested to follow the instructions carefully and complete the exercise as per the time frame communicated without any deviations. Regarding, those teachers who were shifted due to Rationalization in 2015 and are again getting into transfers' zone due to current Rationalization I Merging, such teachers shall be given previous station points i.e. Station points given in 2015 Rationalization exercise. Any deviation of these instructions will be viewed seriously and necessary disciplinary action will be initiated against the defaulters. Attention of all the Regional Joint Directors of School Education and the District Educational Officers in the State is invited to the reference 13th read above, wherein while communicating the orders of the Government issued in the reference 121h cited a revised Time Schedule and Step by Step process for Manual counseling for completion of Transfers exercise was communicated. Keeping in view the delay in submission of filed in applications by Teachers I Gazetted Headmasters and delay in First level and Second Level verification process, a revised Transfer Time Schedule (Annexure-1) for completion of Transfers exercise is herewith communicated. The transfers schedule should be followed scrupulously without any deviation. Further, they are also informed about para 13(g) of G.O.Ms.No.32 SE (Ser.II) Dept., Dated:04.06.2017, whereby the promotion counseling should be conducted after completion of the Transfer counseling to the H.Ms Gr.II, SA (Languages), SA (PE) who were promoted on adhoc basis due to filling up of the posts of MEOs and also upgraded posts respectively in terms of G.O.Ms.No.144 Finance Department, Dated:02.08.2016. Therefore, all the Regional Joint Directors of School Education and the District Educational Officers in the State are requested to take necessary immediate action in the matter. 1. After confirmation by the District Educational Officers, the Seniority lists shall be frozen. All the modifications required, should be made before confirmation of the seniority lists by the DEOs.No further modifications will be allowed. For example,if a teacher applied with spouse points, during the counselling time he/she shall not be allowed to come under general (without spouse points) category. 4. The slot wise list of teachers will be informed I displayed in the website and an SMS will be sent informing the same.Accordingly they will be allowed into the counselling room by the DEOs. 5. Each slot will have one hour time. i.e., 4 to 6 slots pre-lunch session and other 4 to 6 slots post lunch session.By this process maximum of 400 to 600 teachers counselling can be completed per day. 7. Before entering into counselling room the teacher should bring his list of options among the available vacancies school and Manda! wise for easy selection on the system. 10. At the counselling centre Biometric Attendance of the teacher will be taken before generating the posting order.11. After exercising his/her option through online, the vacancy opted will be removed from the list. The proceedings will be generated immediately and can be downloaded from the website. 13". The entire Web assisted Manual counselling process will be supported by the Technical services provided by Centre for Good Governance (CGG) and through a centralised system to maintain the uniformity in all the districts. Sub: - School Education - Issue of Rules - The Andhra Pradesh Teachers (Regulation of Transfers) Rules by the Govt. vide G.O. Ms. No. 31 SE (Ser. II) Dept. Dt:-31.05.2017 - Communication of the G.O - instructions - Issued. Read:- 1) G.O. Ms. No. 32 SE (Ser. II) Dept. Dt:- 04.06.2017.2) This Office Proc.Rc.No.190/Estt-111/2017, Dated:05.06.2017. Attention of all the Regional Joint Directors of School Education and the District Educational Officers in the state is invited to the references 1st and 2nd read above. Government have issued Rules regulating the transfers of the categories of Headmasters of Gr. II Gazetted, School Assistants and Secondary Grade Teachers and their equivalent categories in the AP. School Education Subordinate Services working in the Govt. Schools and Z.P.P. and M.P.P. Schools in the state. 1. For the purpose of transfers of Teachers, the assessment of Teacher posts required in any school shall be based on U-DISE of the previous academic year with cut-off date as31st December. 3. For this purpose, the Teachers who joined on or before 17-11-2009 in the present school and the HMs Gr. II who completed 5 years of service as on the date of closure of the schools i.e. as on 24.04.2017 in a particular school shall be transferred compulsorily. 4. Those who are going to retire within 2 years from so" June, 2017 shall not be transferred without their request for transfer. 5. Male teachers who crossed 50 years of age as on so" April, 2017 may be considered for posting in Girls High Schools only when female Teachers I H.M. Gr. II are not available to post in Girls High Schools. 6. (i) The Headmaster Gr.II Gazetted and Teachers who have completed 5 years of service and 8 academic calendar years of service respectively as NCC Officer should be posted in a vacancy in a school where there is NCC unit. 9. DEOs shall have to ensure that mandal wise the equal percentage of vacancies to be kept unfilled in all the mandals. This must be observed category wise, subject wise in all the mandals during the Transfers Counseling. 10. The teachers being shifted on completion of the Rationalization exercise in Primary Schools, Upper Primary Schools and High Schools shall be preferably posted to those schools where such school is being merged with or where such new posts have come up due to rationalization. In case such Teacher is not willing for that, they can be allowed to participate in the transfer counseling by following the norms. 13. Transfers shall be effected within the present management in which the Teacher I H.M.Gr.II is working. 14. If the teacher I Headmaster Gr.II desires to go to his I her parent management such Teacher I Headmaster Gr.II may opt for transfer to only those vacancies available in their parent management subject to availability of vacancies in the parent managements. In such instances, their seniority shall be taken into account in the parent management. 15. The l.T. Cell of this office will facilitate the process of Teachers I Headmasters Gr.IItransfers counseling through online process till completion of allotment of places. 16. Entitlement of points shall be awarded to the Headmaster Gr.II I Teachers service rendered in the present school, category as on 30th April, 2017. 17. It shall be ensured that list of habitations and categories of areas in the district which do not have connectivity through an all-weather road are published by the Collector ~ District Magistrate as per the norms of Panchayat Raj (Engineering) Department in consultation with the Superintending Engineer, P.R. of the district. 18. The spirit of allowing special points (Extra Points) under Rule 7 (iii) is intended to facilitate the spouse to come nearer to the spouse only. The Headmaster Gr.11 /Teacher wishing to avail this special points shall be opt to nearer places of his I her spouse working place i.e. in the same district I adjacent district. 19. For performance points under Rule 9 (a) & (b) U-DISE- 2015 and U-DISE 2016 shall be taken into account regarding increasing enrolment during last two years. 20. For individual related performance points under Rule 10 (a), the Headmaster Gr.II who got National I State Award on or after 2012 and not availed entitlement points during previous counseling and Teachers who got National I State Award on or after 2009 and not availed the entitlement points during previous counseling can avail the benefit now.21. Under Rule 10 (g), all the upgraded posts (either filled by way of promotion or not filled)should be notified as vacancies. 22. The DEOs shall arrange for a computer operator, computer systems and internet connection at MRCs for Gr.11 HMs/Teachers to submit their online transfer application with ease and convenience.